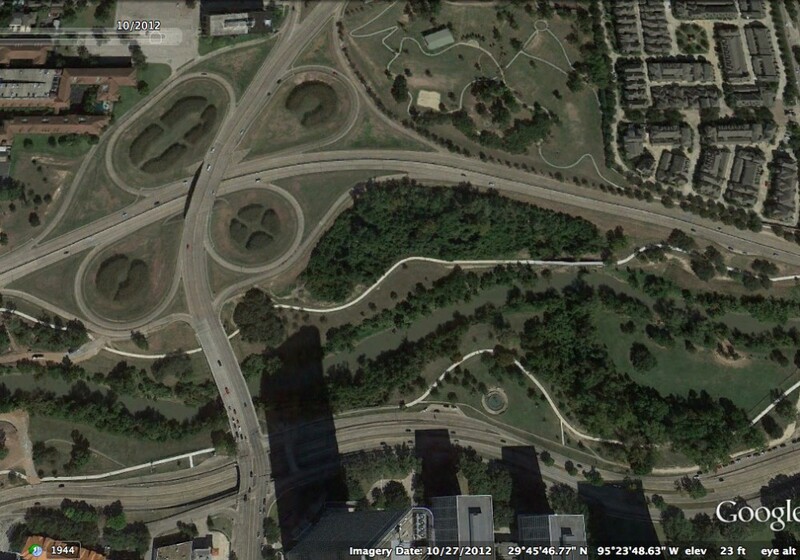 The Harris County Flood Control District describes the Memorial Park project as “natural channel design,” which is a term that apparently has come to mean just about any channelizing project that doesn’t include concrete but does include curves. 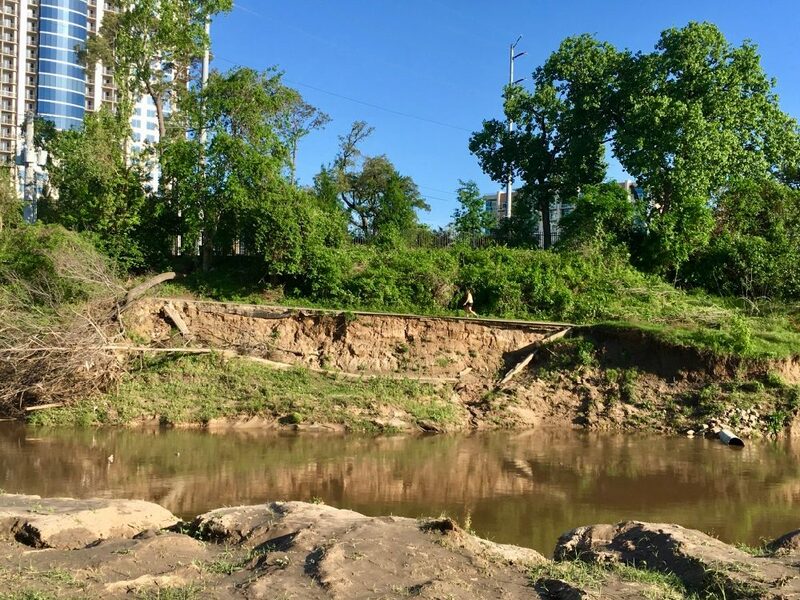 Natural channel design has a history of failed and washed out projects, and we believe this controversial and destructive method proposed for Memorial Park has a risk for failure also. 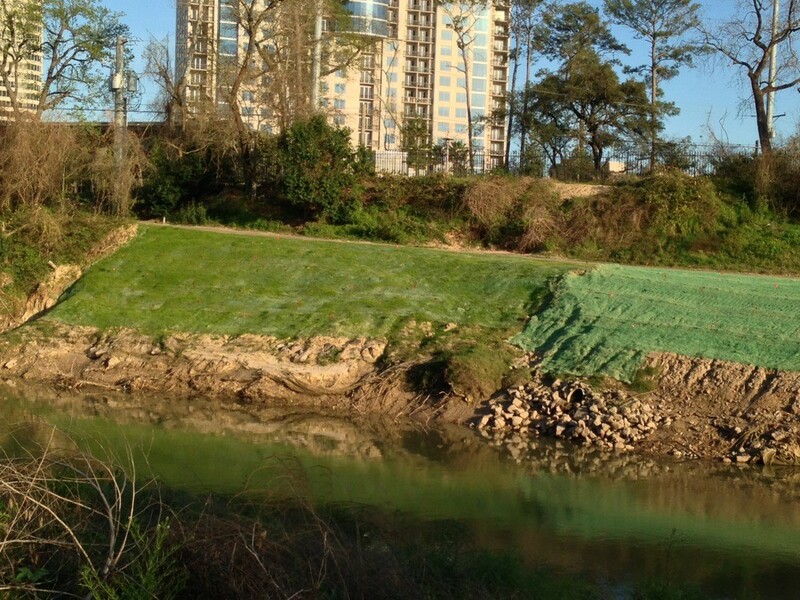 Let us look at the success of the district’s “natural stable channel design” project in the highly popular Buffalo Bayou Park. 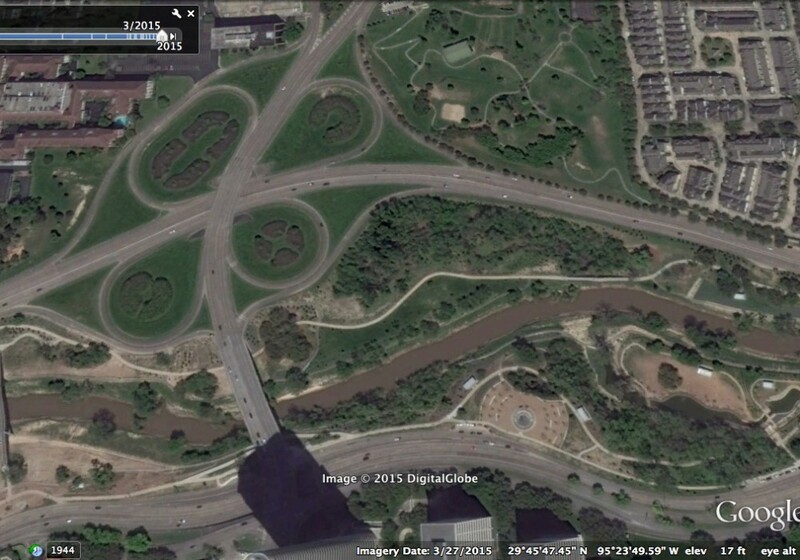 (See also the disastrous project in Fonteno Park.) 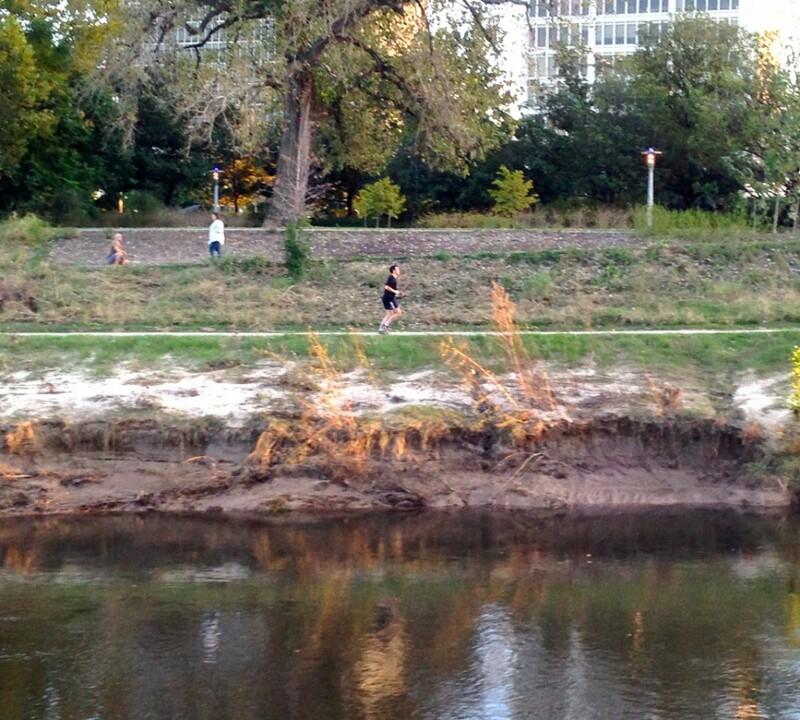 The many happy users of this lovely and much-needed park between Memorial Drive and Allen Parkway may not realize that much of the erosion and major tree loss happening on the slopes and lower banks are the result of changes wrought by the Flood Control District, which scraped up the banks with backhoes, removed a large amount of natural riparian vegetation and trees, and graded the banks with bulldozers, all of which runs counter to best management practices for riparian zones. 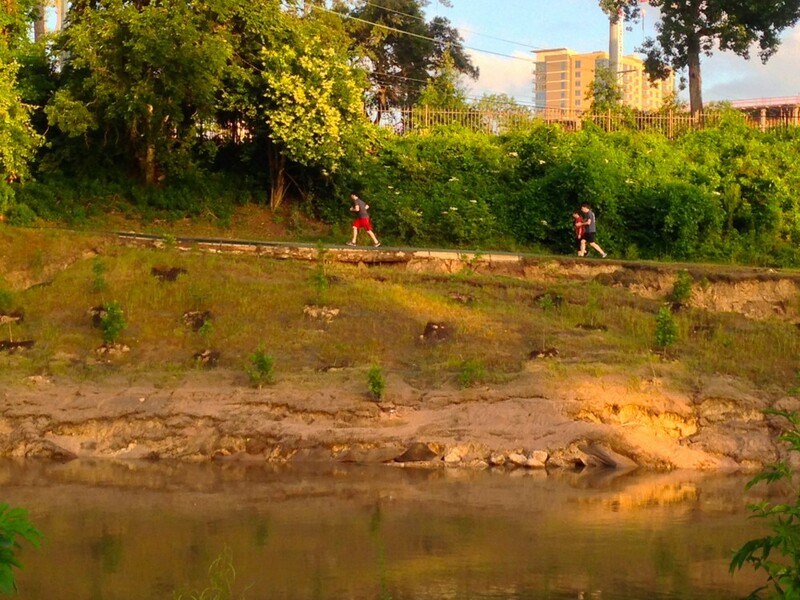 Watch this slide show of photographs taken in Buffalo Bayou Park between Shepherd Bridge and Montrose on Nov. 15, 2015 (updated Jan. 27, 2019). 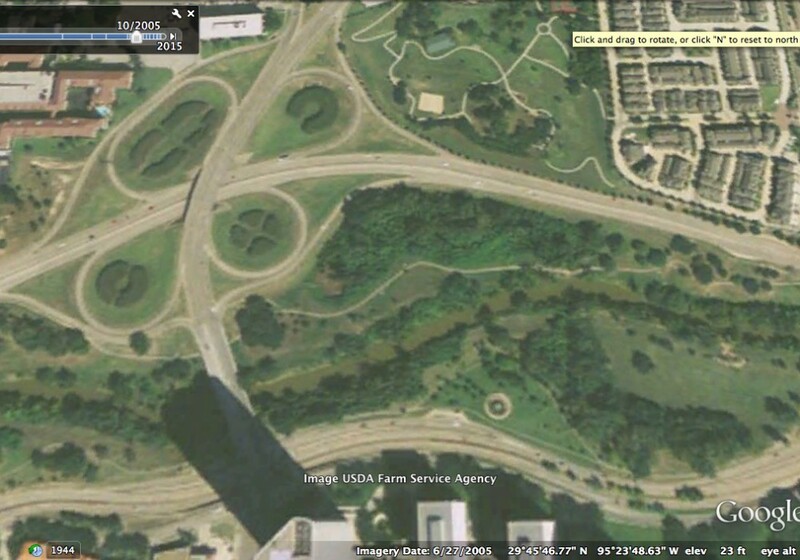 And then below watch a previous slide show showing the evolution of Buffalo Bayou between the Shepherd and Sabine bridges. 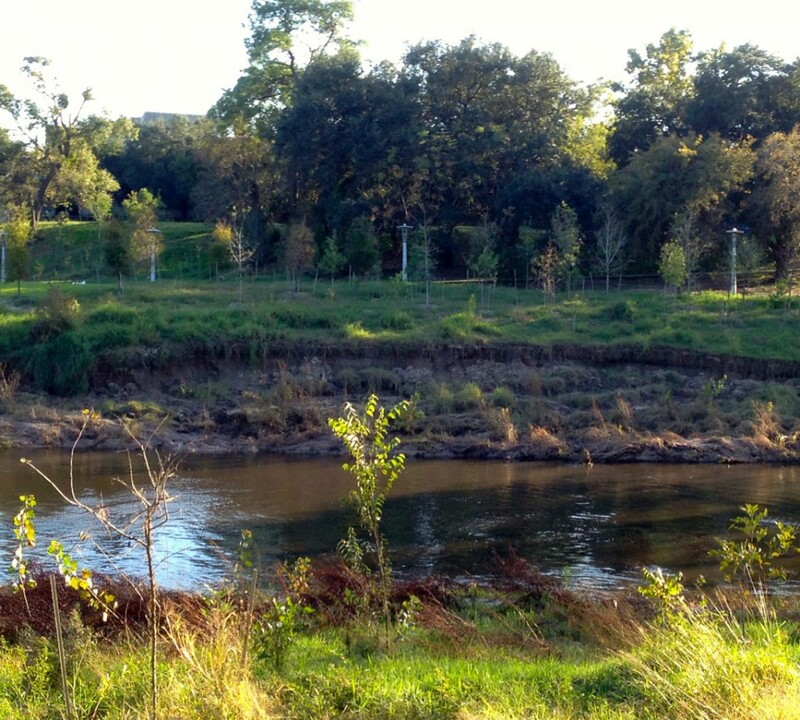 Slumping in south bank downstream from Shepherd, Nov. 16, 2015. 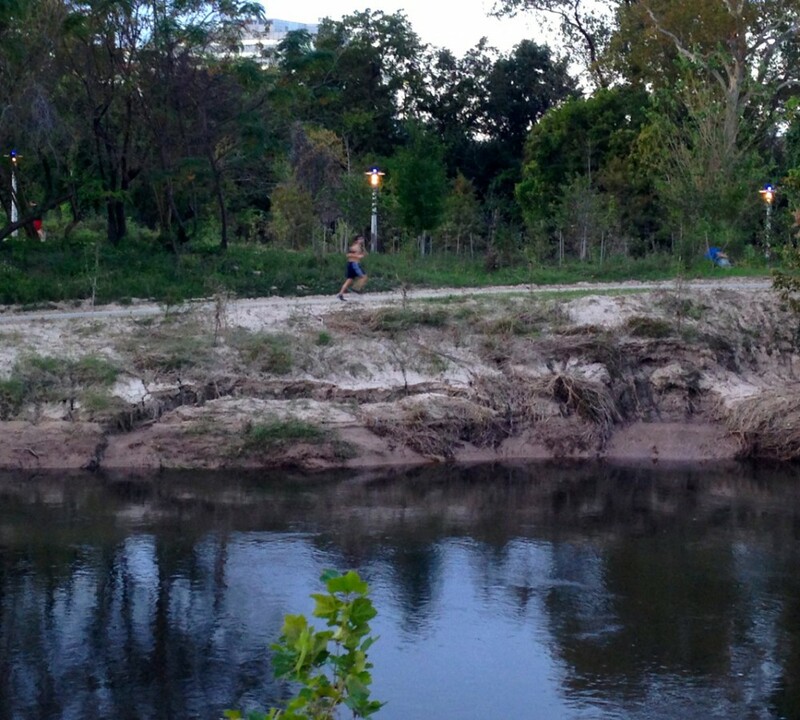 Undermined by removal of surrounding vegetation, big cottonwood falls. 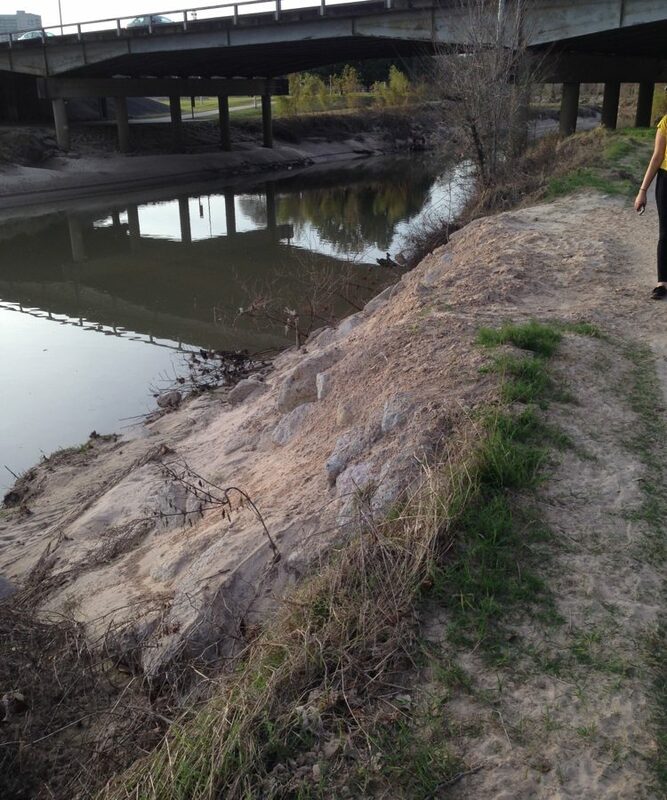 Notice that the bayou has steepened its bank previously graded by Flood Control. 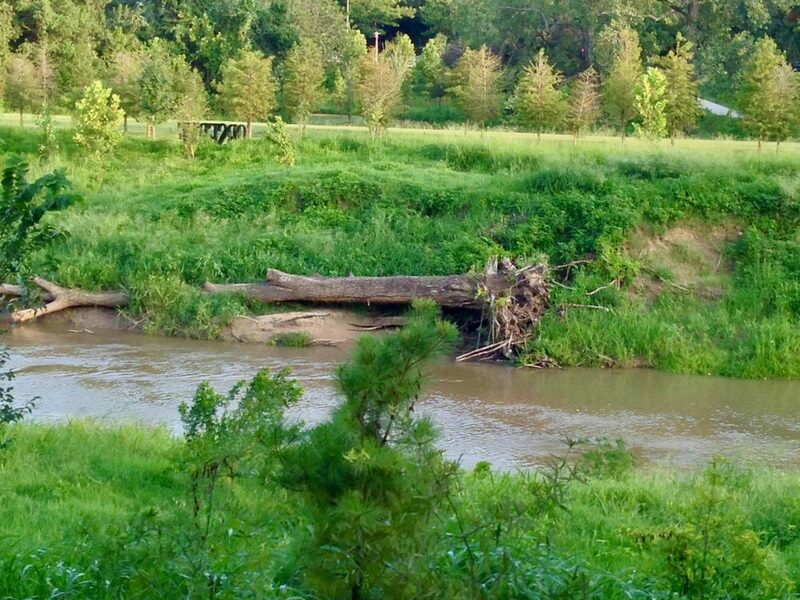 Photo June 13, 2016. 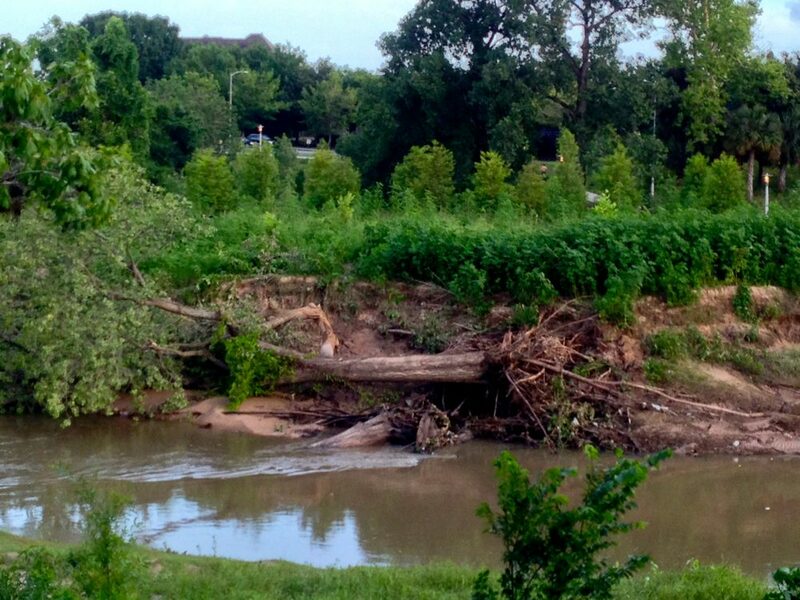 Same fallen tree and bank on August 5, 2017. 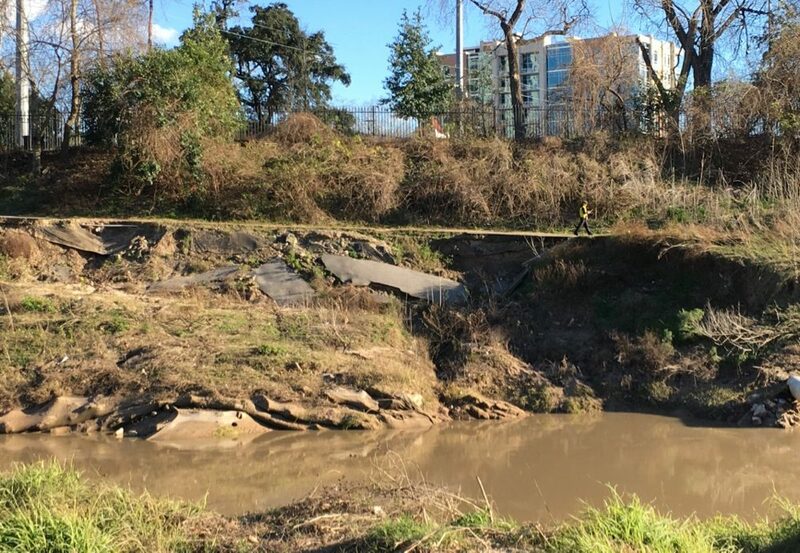 Same location, former site of tall cottonwood as well as other trees, since removed, on Dec. 18, 2018. 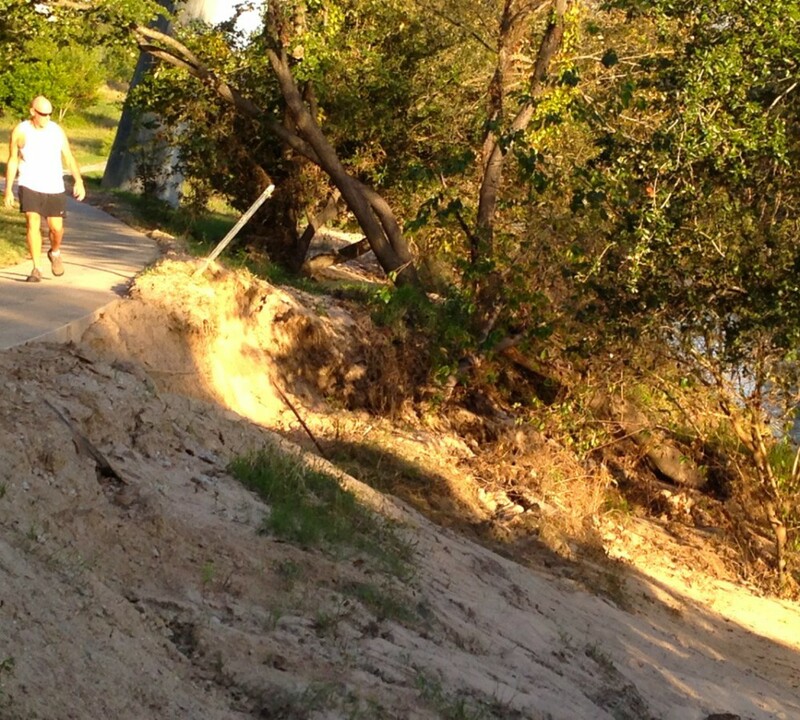 Slumping south bank near Dunlavy threatening sidewalk, Nov. 16, 2015. 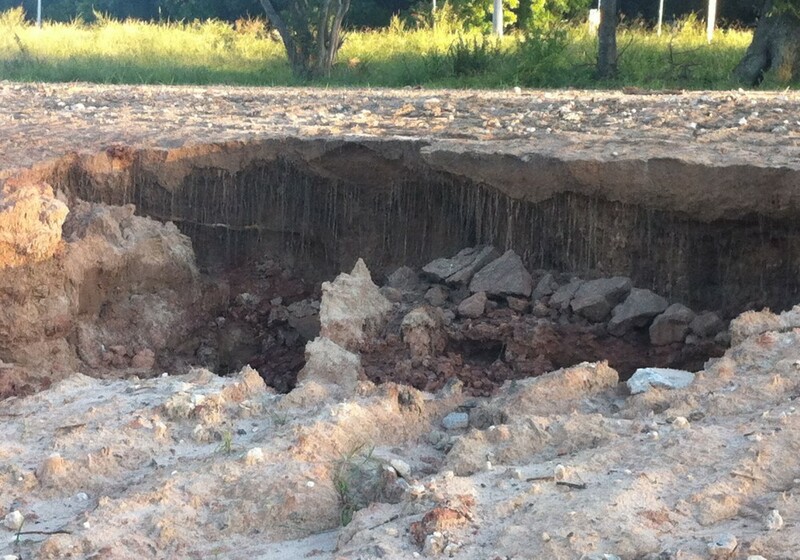 Same location on Feb. 24, 2017, after repeat repairs. 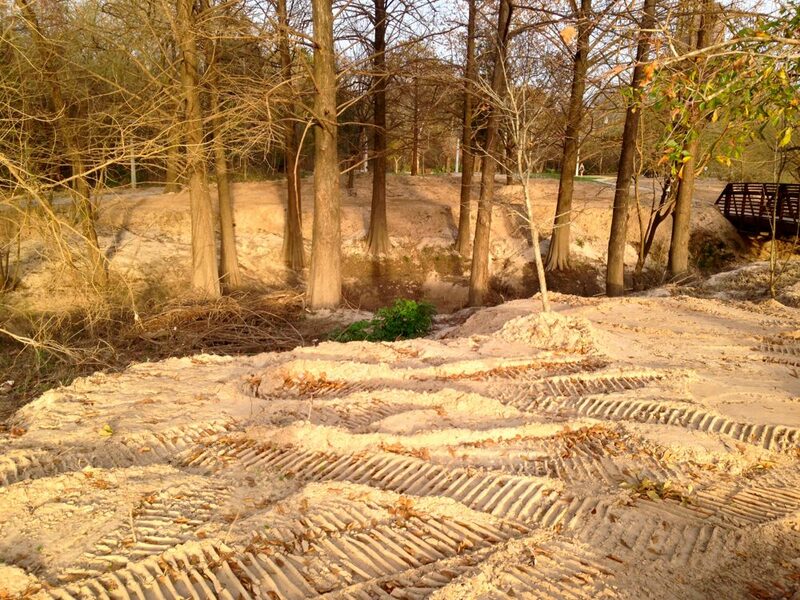 Our research show that where the banks are collapsing is where the bayou's original meanders were. 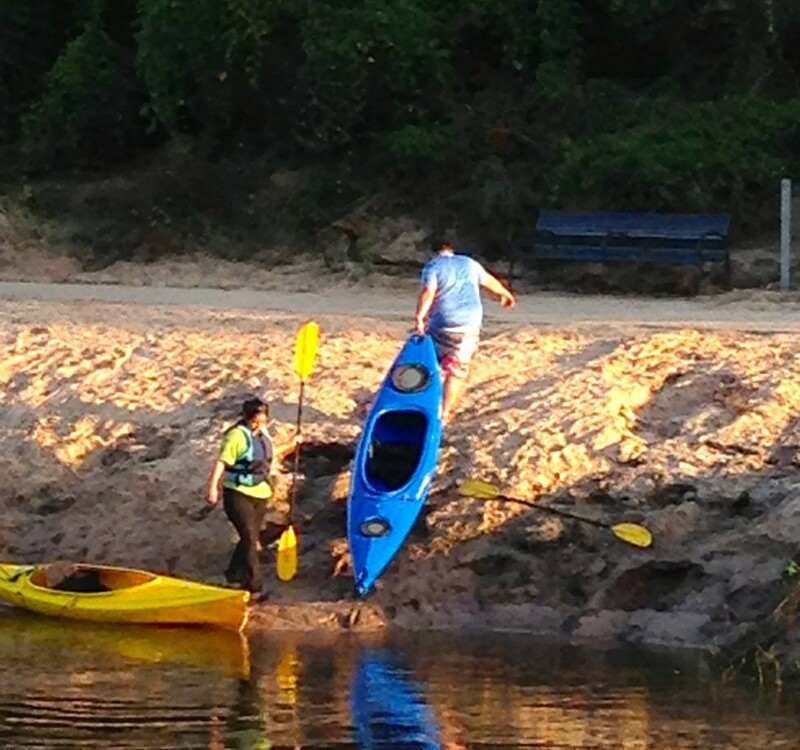 The boat launch at The Dunlavy on the south bank, Nov. 16, 2015. 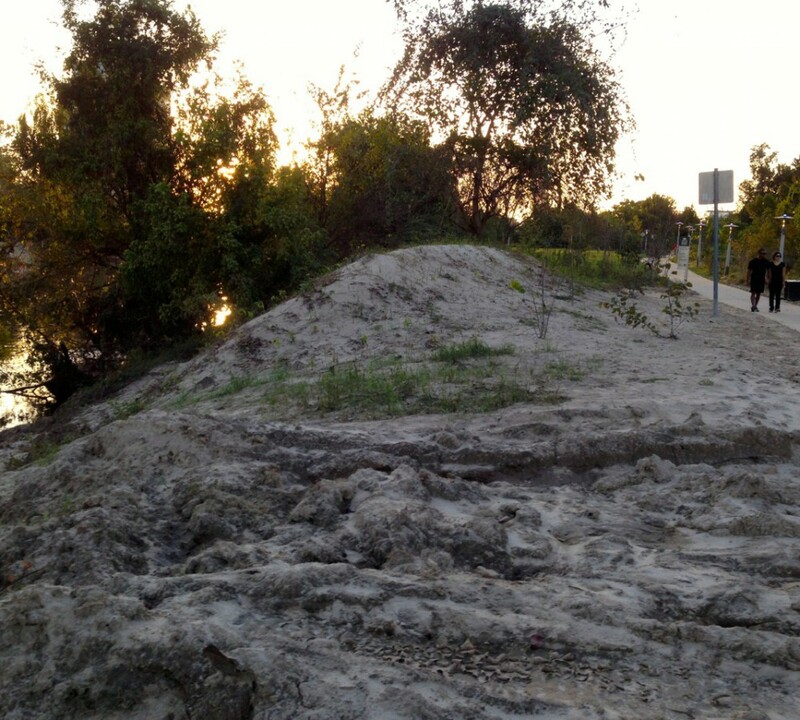 Sidewalk threatened on north bank, Nov. 16, 2015. 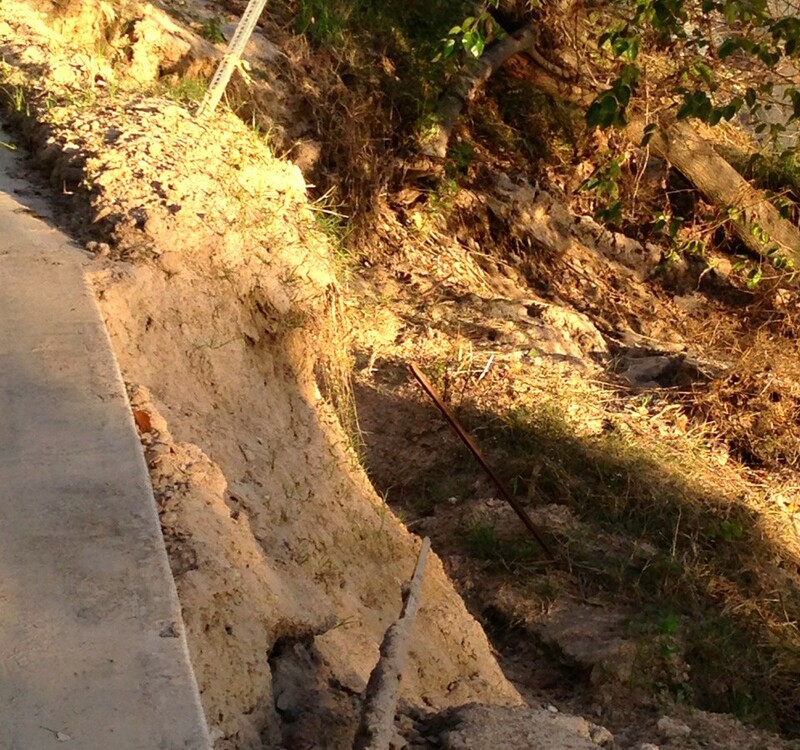 Detail of sidewalk about to collapse on north bank, Nov. 16, 2015. 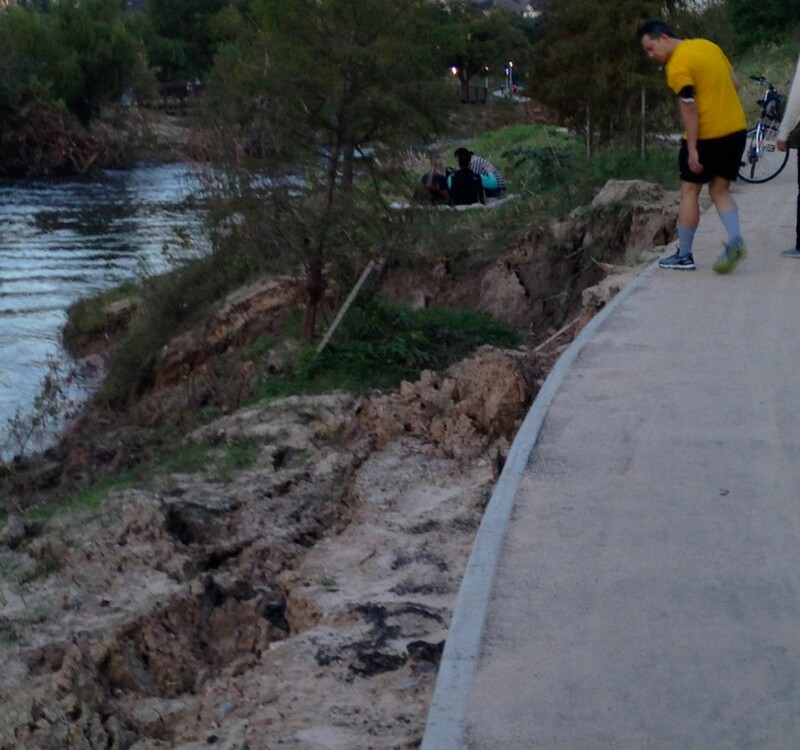 Another section of sidewalk about to collapse on the north bank, Nov. 16, 2015. 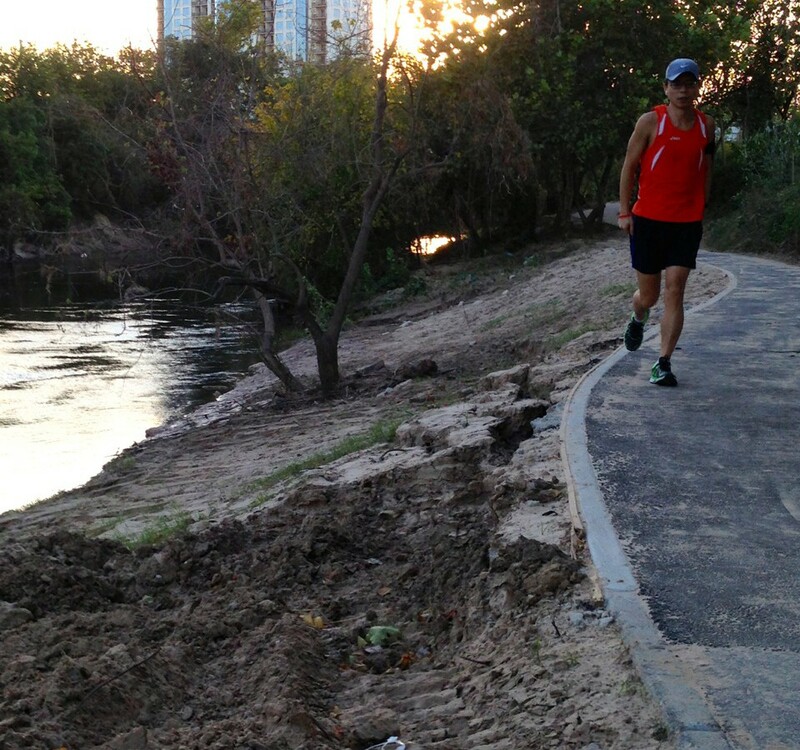 Jogger on another section of sidewalk threatened by collapsing bank on north side of the park, Nov. 16, 2015. 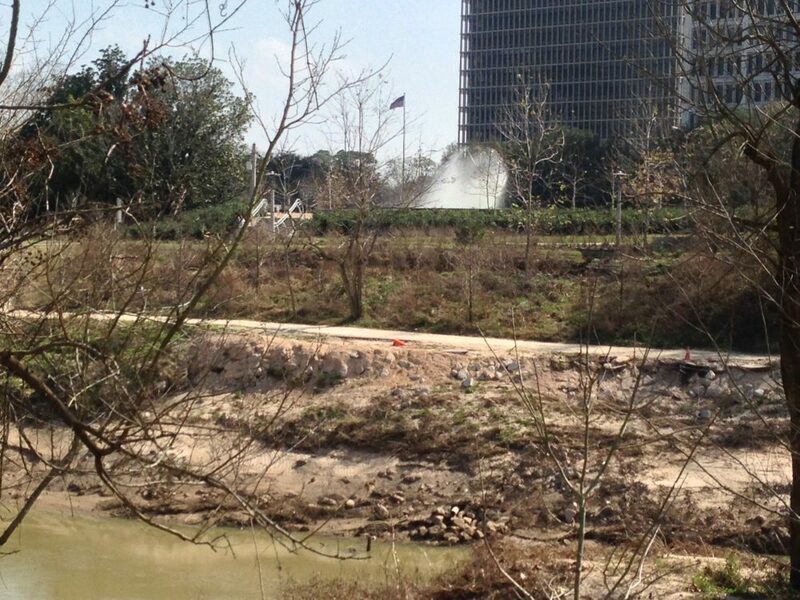 Same location of repeat collapse on north bank opposite the Dunlavy two years later on Feb. 8, 2017. 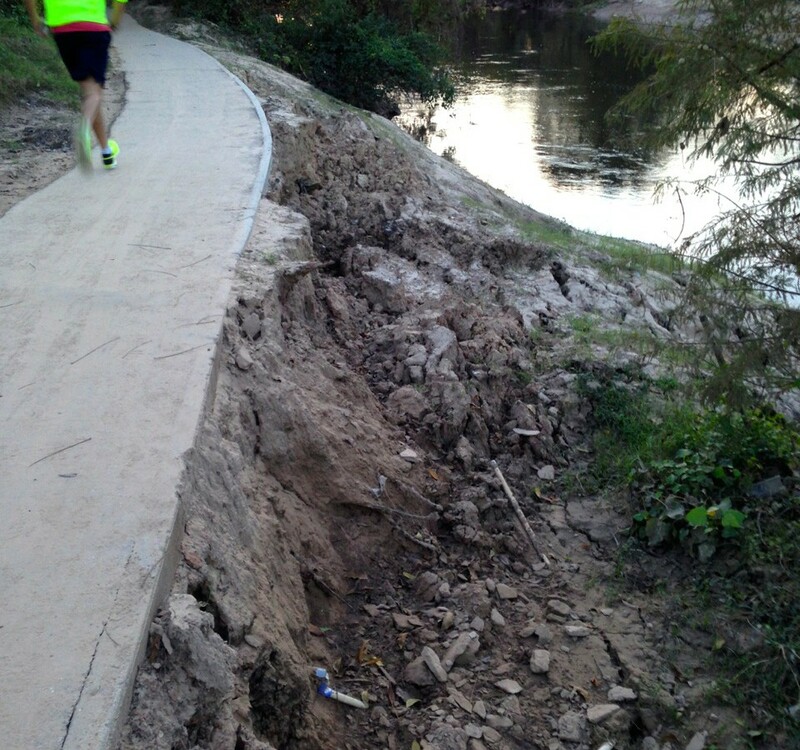 Attempted repairs on same section of north bank on Feb. 8, 2017. 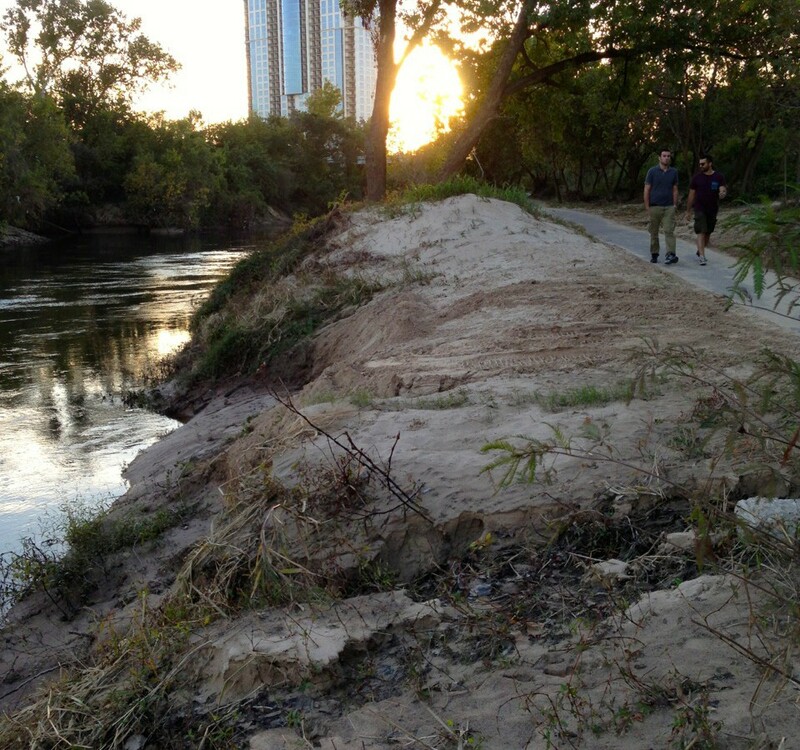 Collapsing south bank east of the Dunlavy, Nov. 16, 2015. 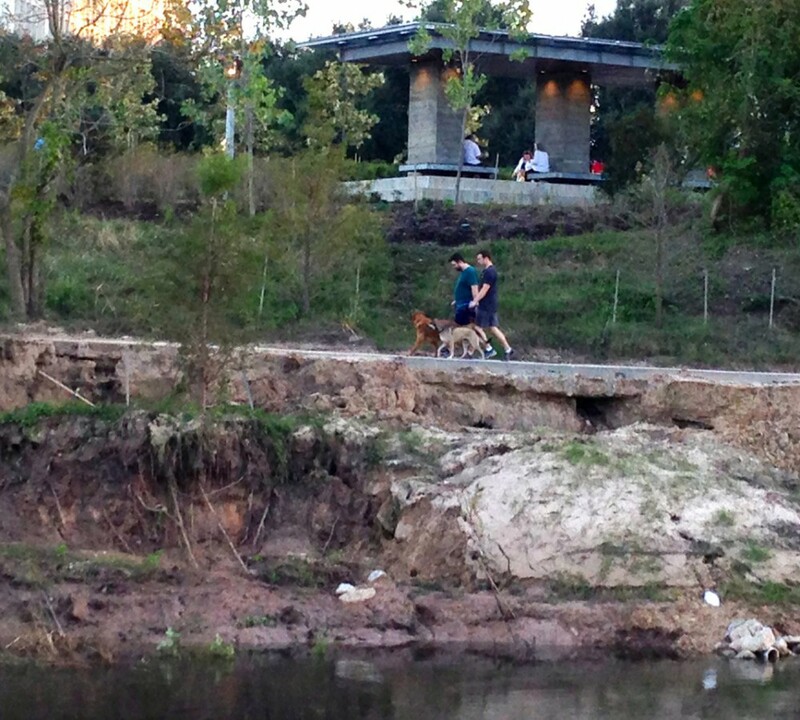 Collapsing south bank threatening sidewalk east of the Dunlavy, Nov. 16, 2015. 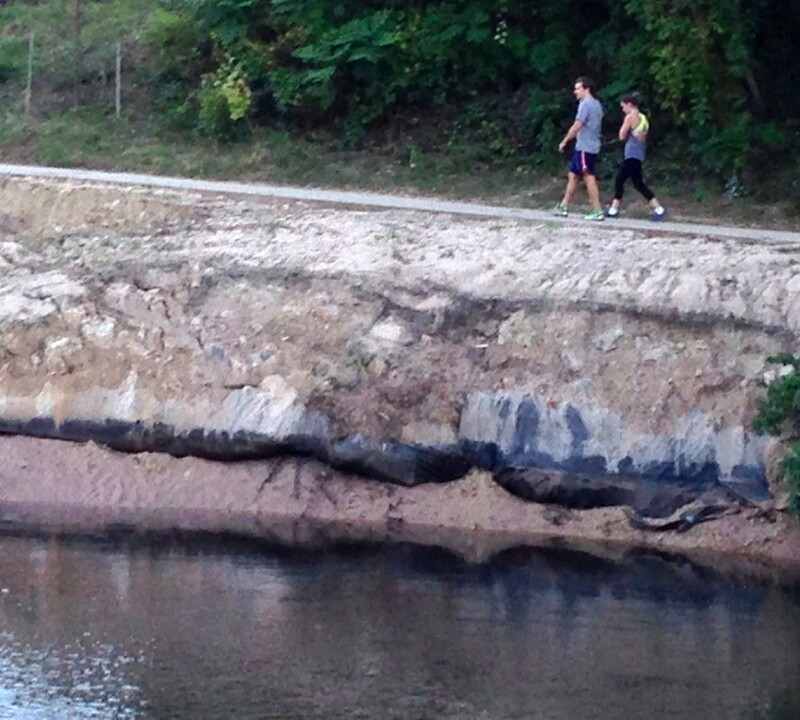 Vegetation destroyed and bank covered with sediment on north side of park, Nov. 16, 2015. 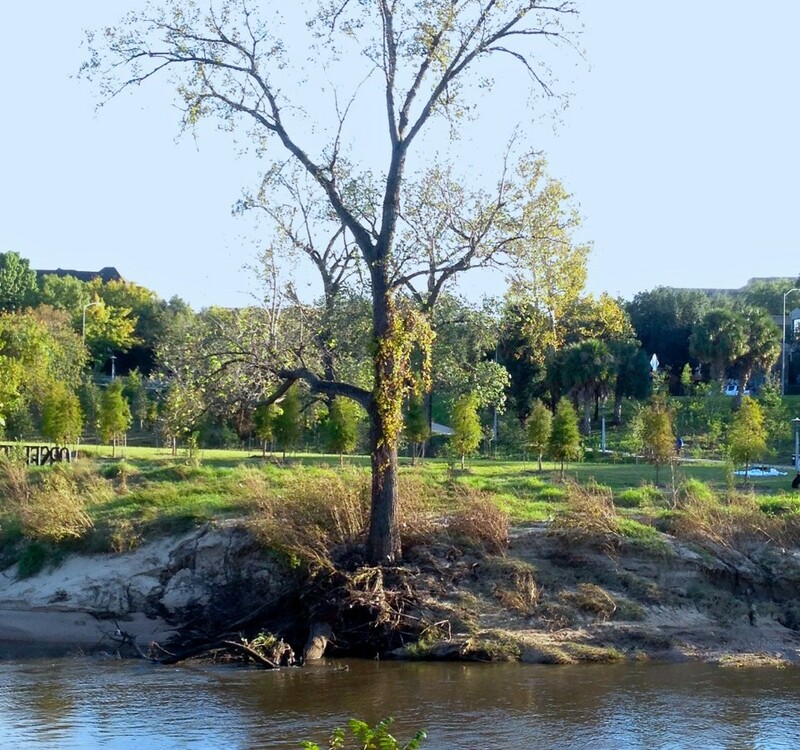 Deposition on south bank of Buffalo Bayou in the park near Montrose, Nov. 16, 2015. 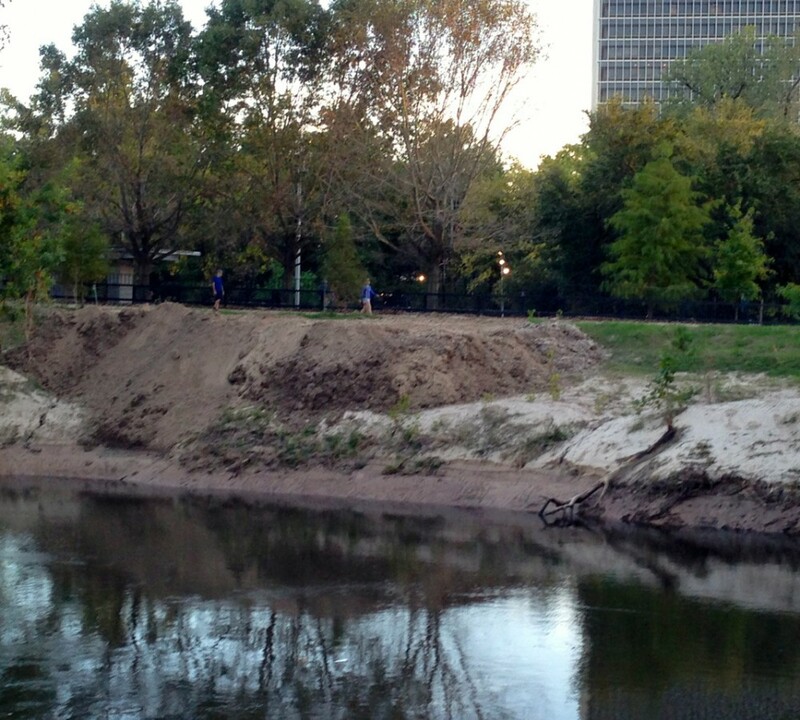 Sediment collected on north bank of the park, possibly scraped from sidewalks, Nov. 16, 2015. 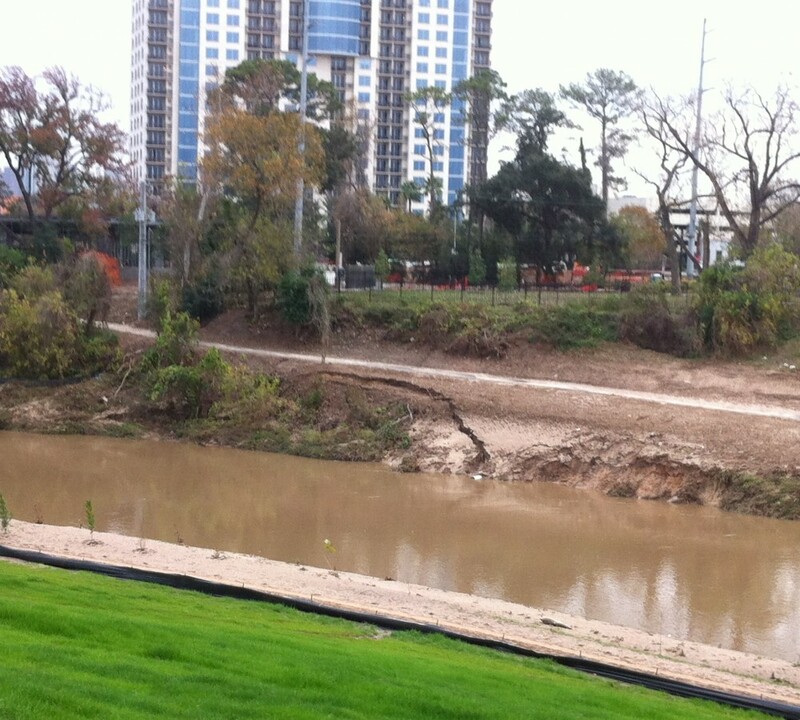 Sediment on south bank scraped out of the dog park, Nov. 16, 2015. 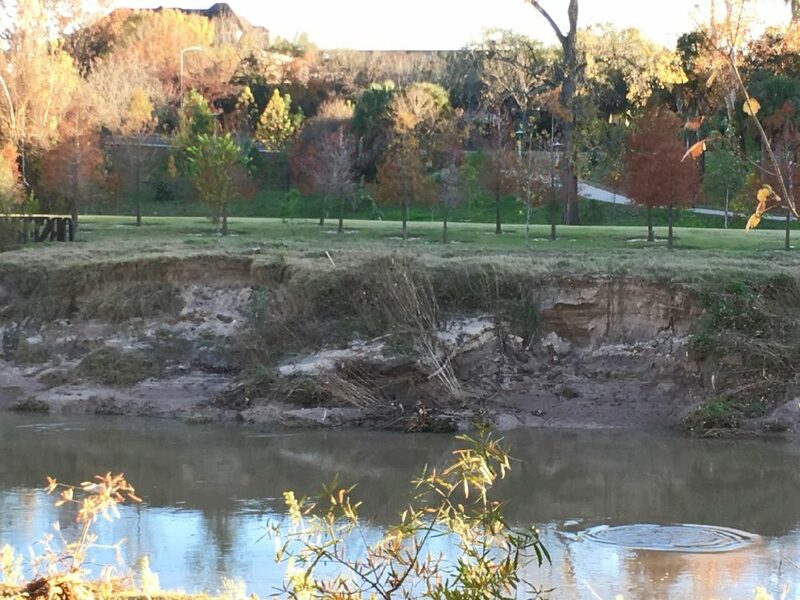 Deposition and erosion on north bank near Montrose, Nov. 16, 2015. 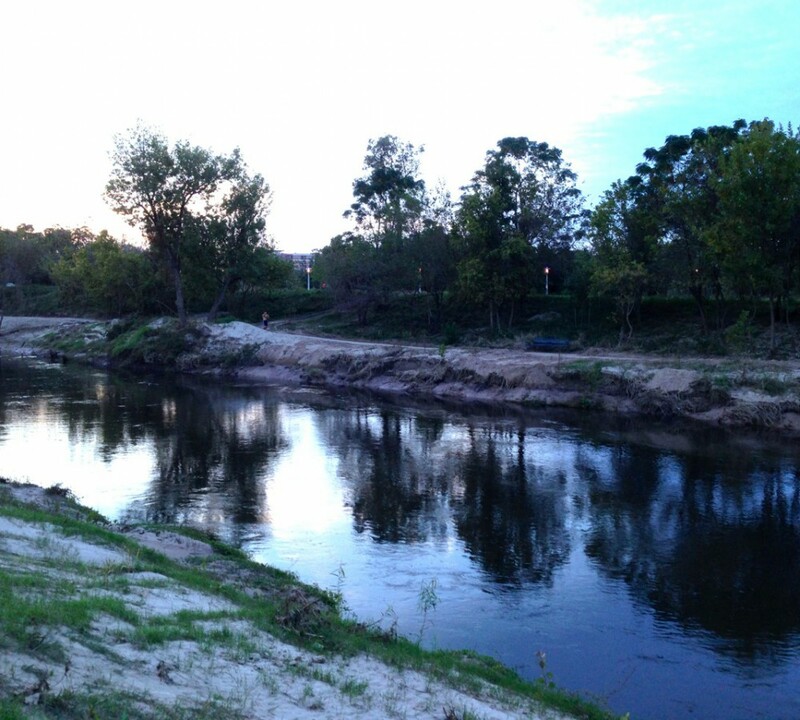 Looking upstream at sunset west of the Rosemont Bridge, Nov. 16, 2015. 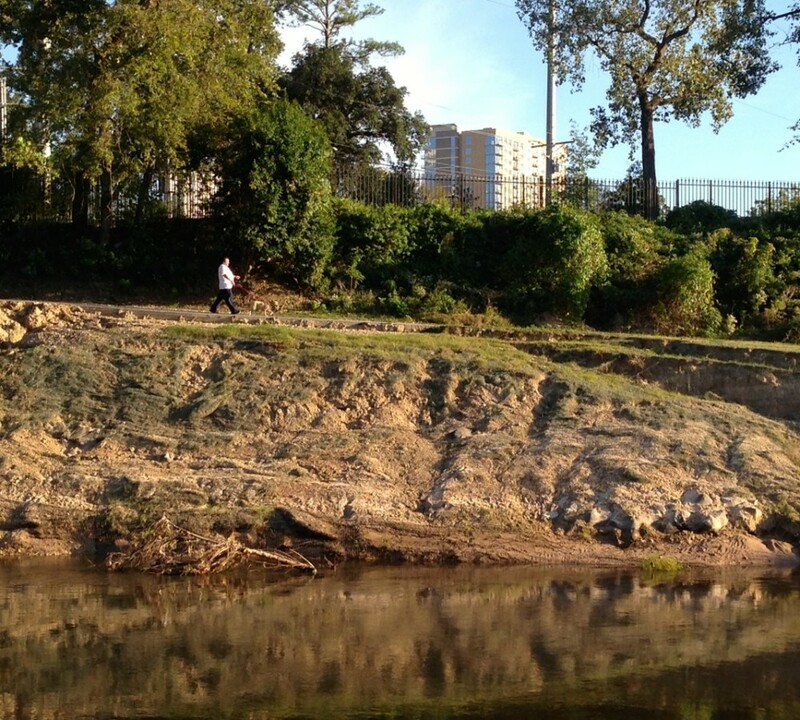 North bank of Buffalo Bayou in Buffalo Bayou Park moving upstream towards Dunlavy, Nov. 16, 2015. 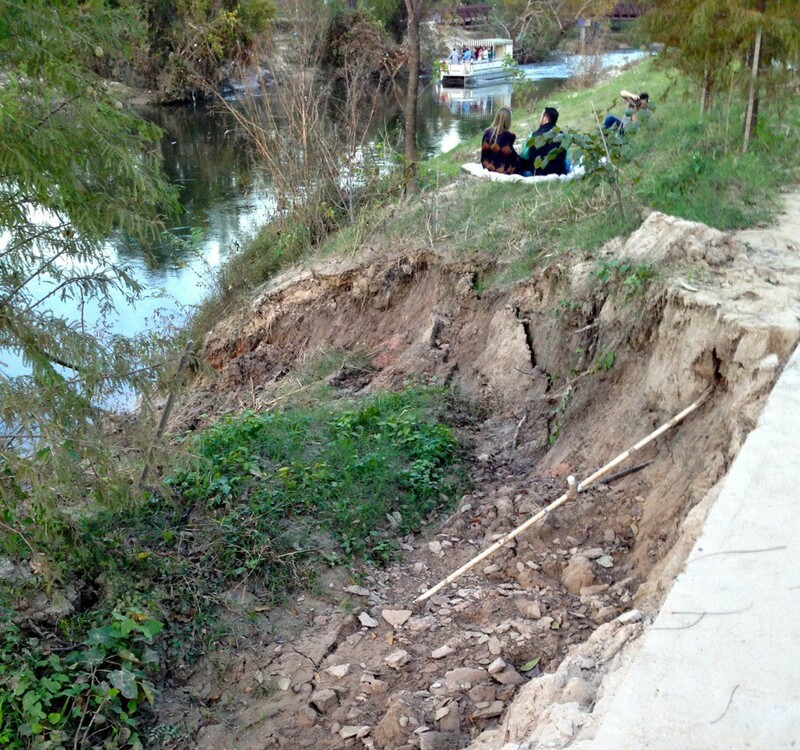 Collapsing bank threatening sidewalk on south bank west of Montrose, Nov. 16, 2015. 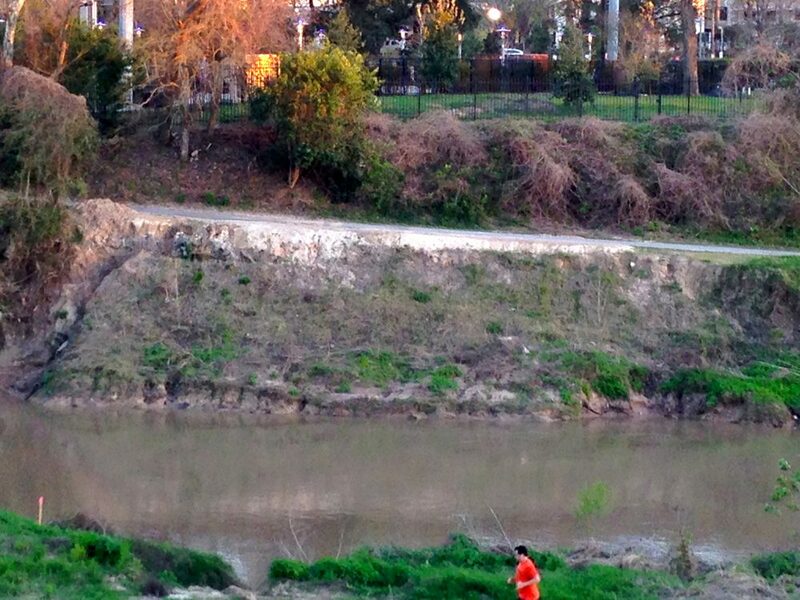 Runner gazing into same bank collapse on south bank of the bayou, Nov. 16, 2015. 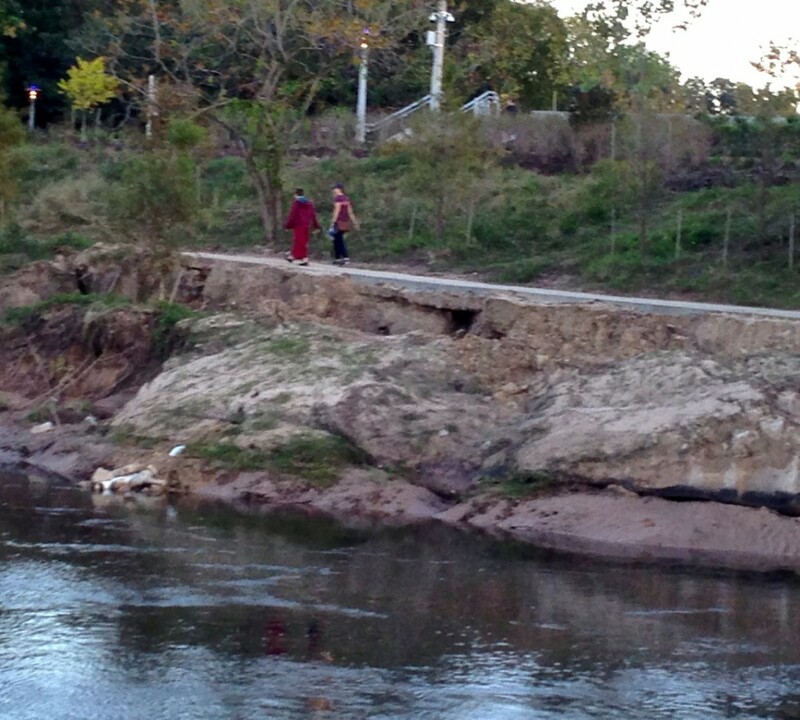 The upstream section of the same collapsing bank on the south bank moving upstream towards the Dunlavy, Nov. 16, 2015. 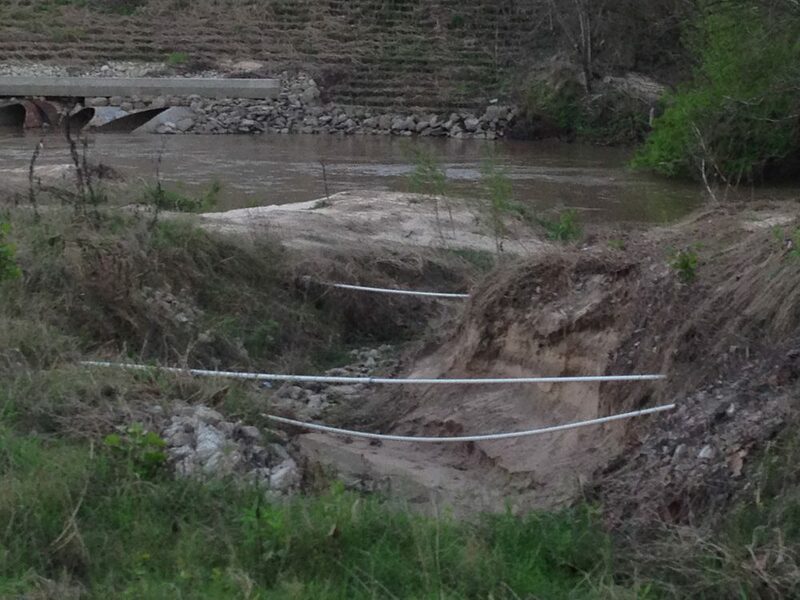 Repeat repair of collapsing bank where Buffalo Bayou is seeking out its original meanders. Photo Feb. 8, 2017. 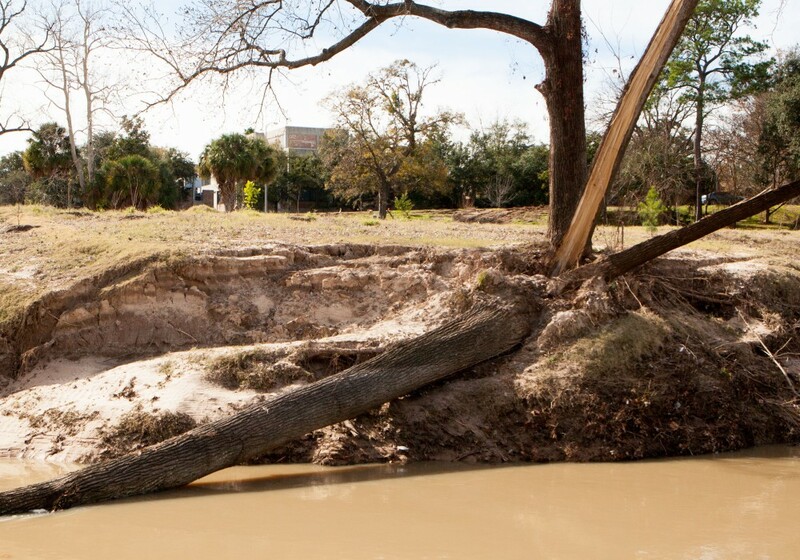 Watch this slide show on the evolution of Buffalo Bayou between Shepherd and Sabine bridges. 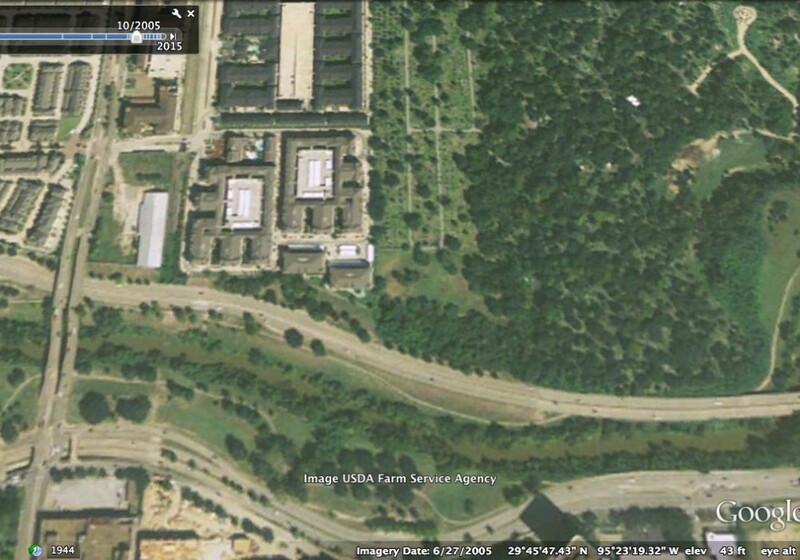 Buffalo Bayou between Shepherd and Waugh drives on June 27, 2005, before the Harris County Flood Control District's "natural stable channel design" project. 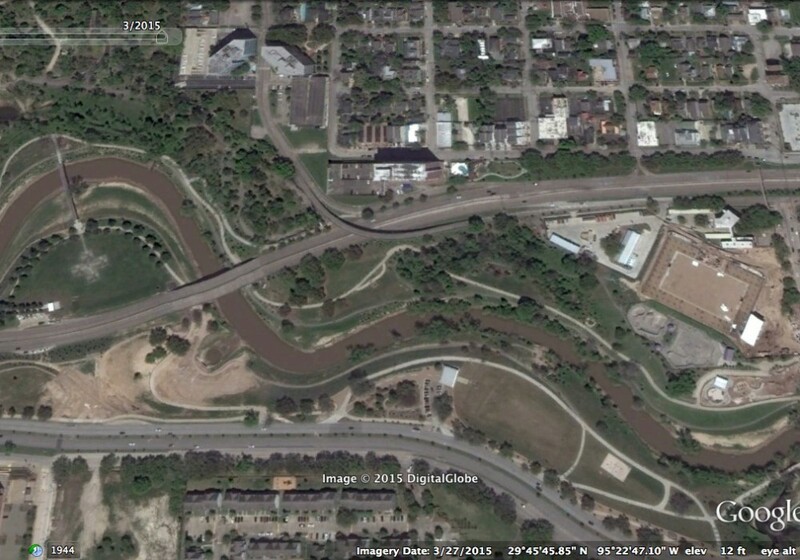 Same view of Buffalo Bayou downstream (east) of Shepherd on October 27, 2012, as the flood control district was beginning its channelization project. 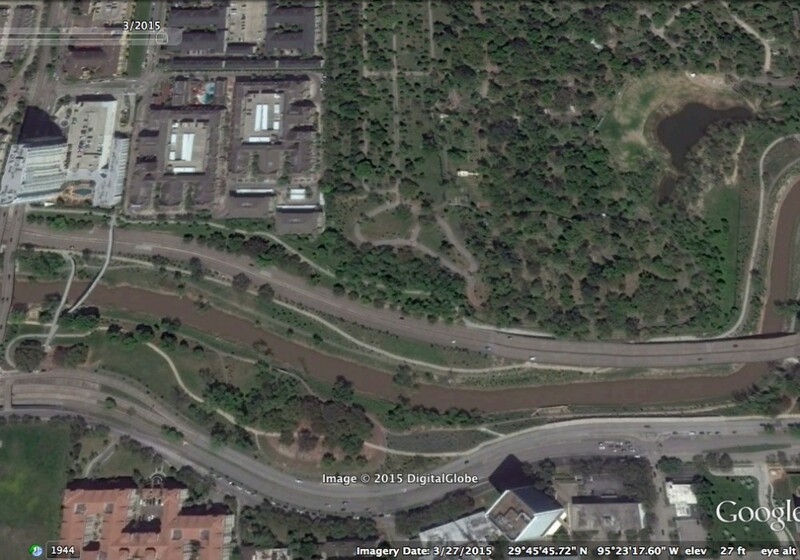 Same stretch of Buffalo Bayou on March 27, 2015, after channelization begun in 2012. 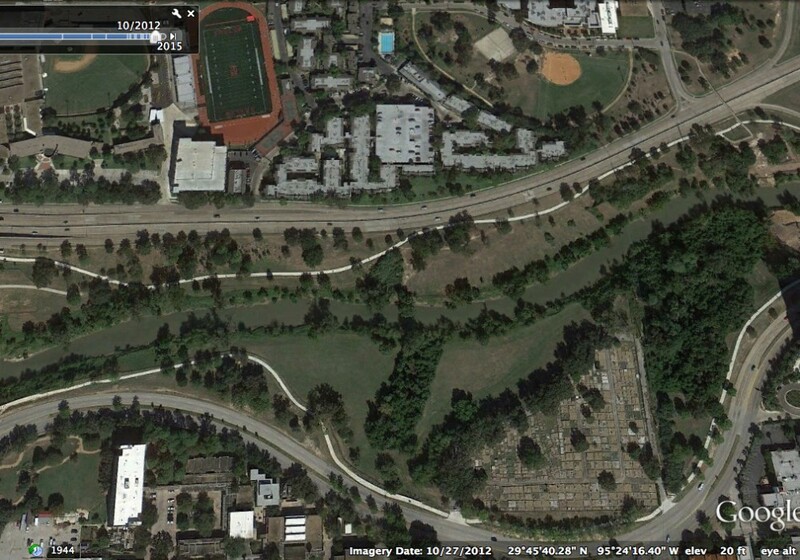 Note the extensive loss of trees and vegetation on the north and south banks of the bayou. 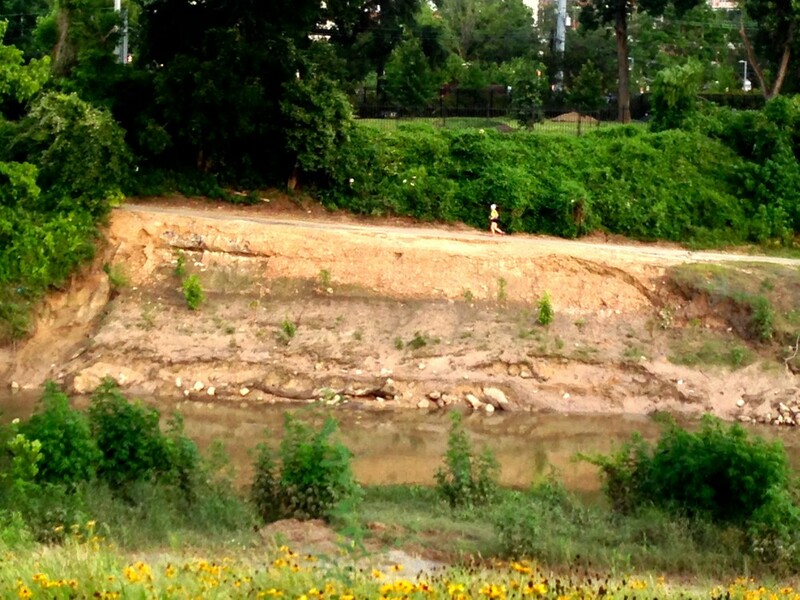 Bank erosion in Buffalo Bayou Park requiring repeated remediation after riparian buffer removal. 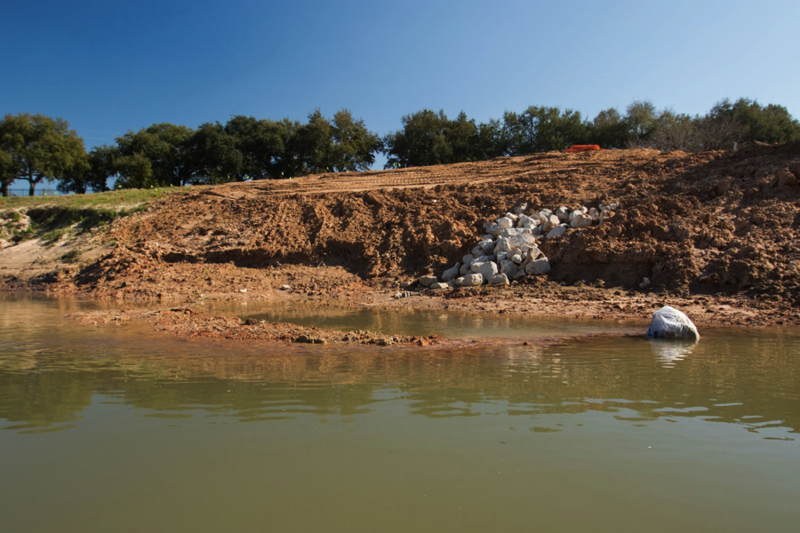 Photo by Jim Olive on February 17, 2015. 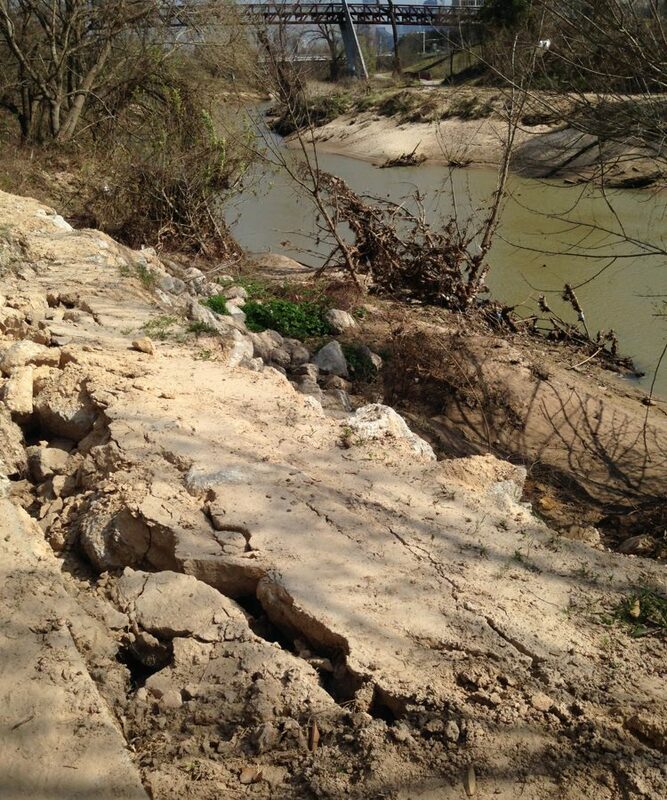 Bank erosion in Buffalo Bayou Park after removal of riparian buffer by the Harris County Flood Control District. 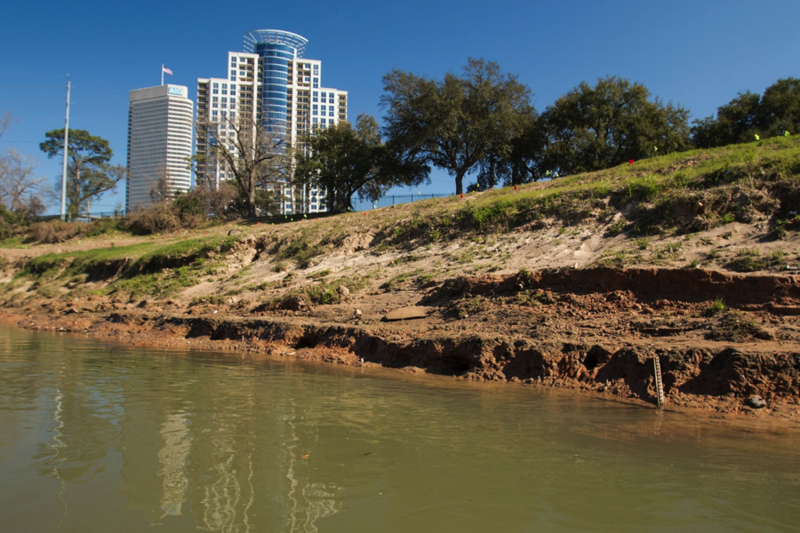 Photo Feb. 17, 2015, by Jim Olive. 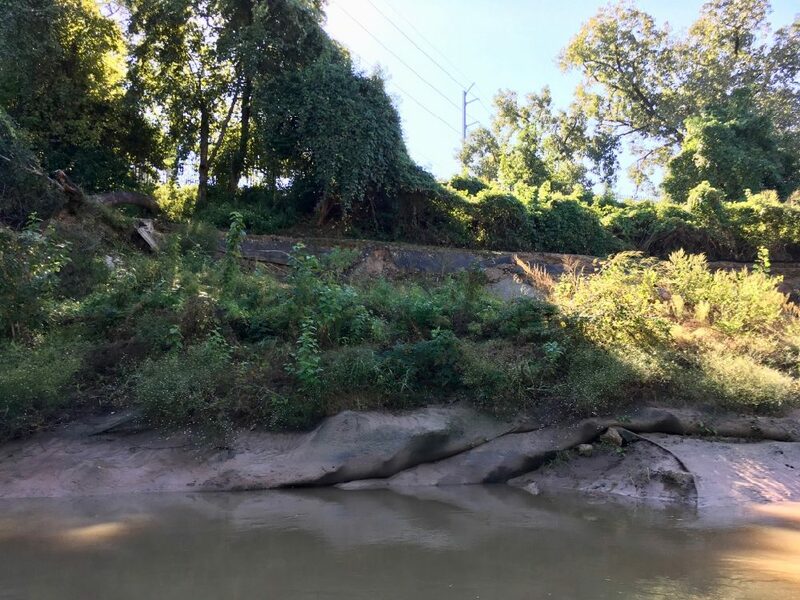 Collapsing bank in Buffalo Bayou Park after "restoration" by the Harris County Flood Control District using "natural stable channel design." 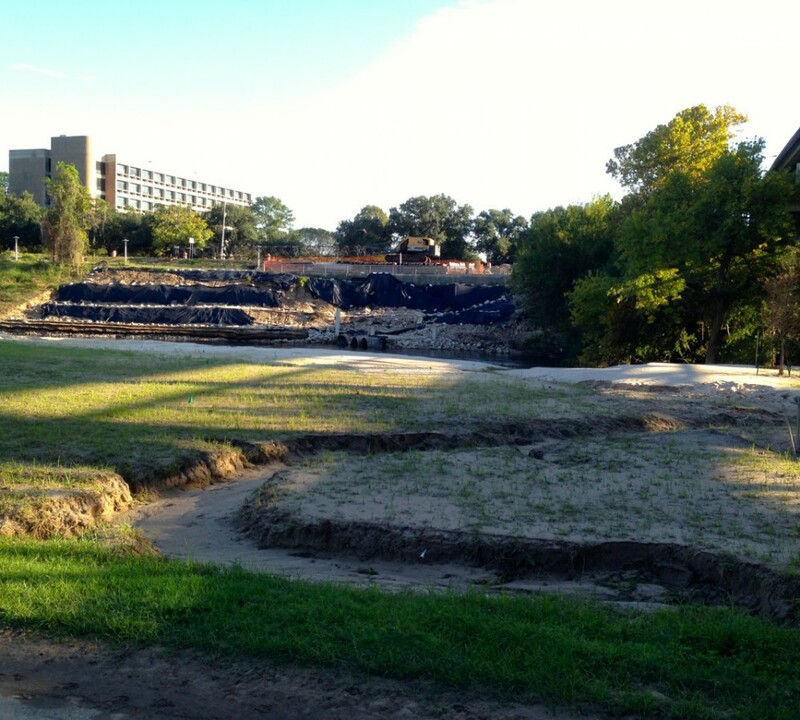 Photo taken April 8, 2015, below the site of the new Dunlavy restaurant west of Waugh by Susan Chadwick. 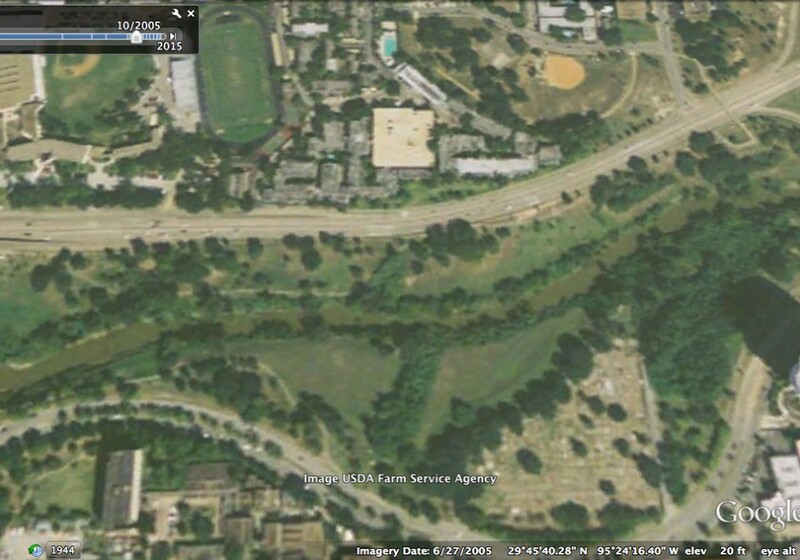 Buffalo Bayou at Waugh Drive on June 27, 2005, before recent channelization. 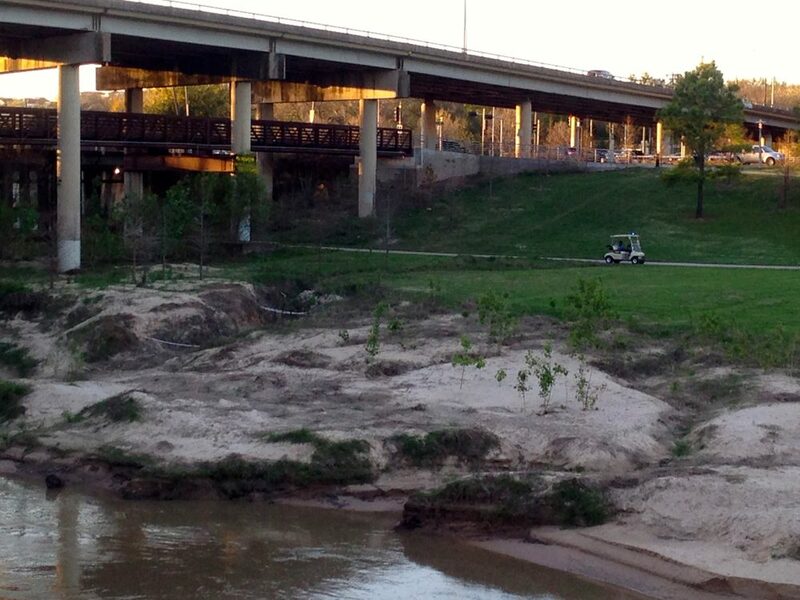 Same view of Buffalo Bayou on October 27, 2012, as the flood control district was beginning its "natural stable channel design" project. 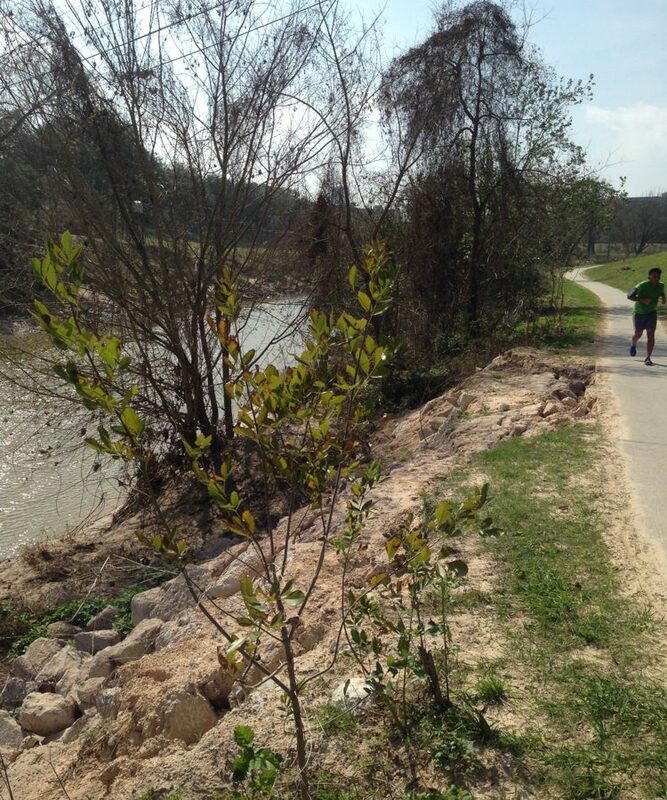 Buffalo Bayou Park at Waugh on March 27, 2015, after channelization by the Harris County Flood Control District. 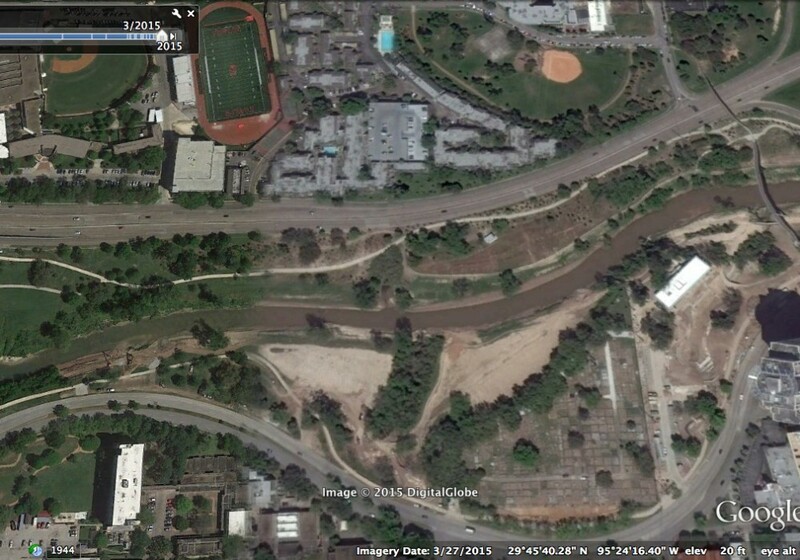 Note tree and vegetation loss along both banks. 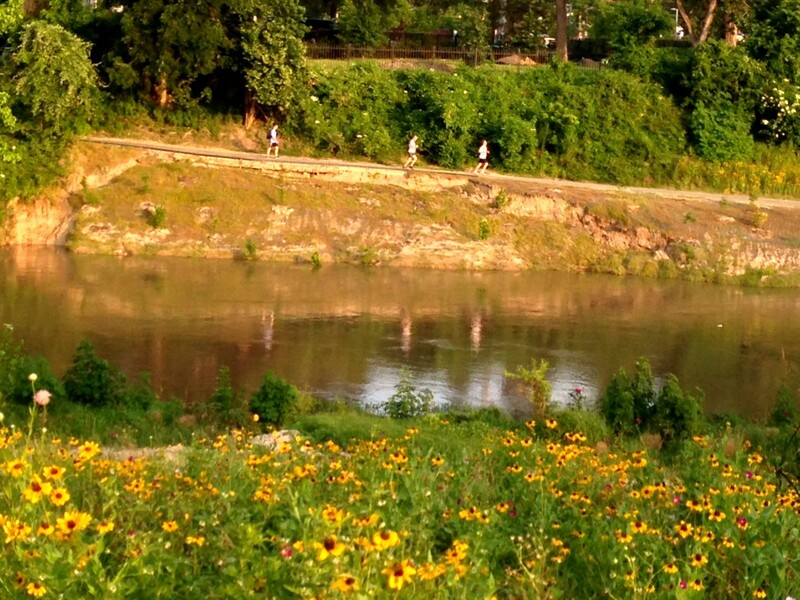 Buffalo Bayou east of Montrose on June 27, 2005. 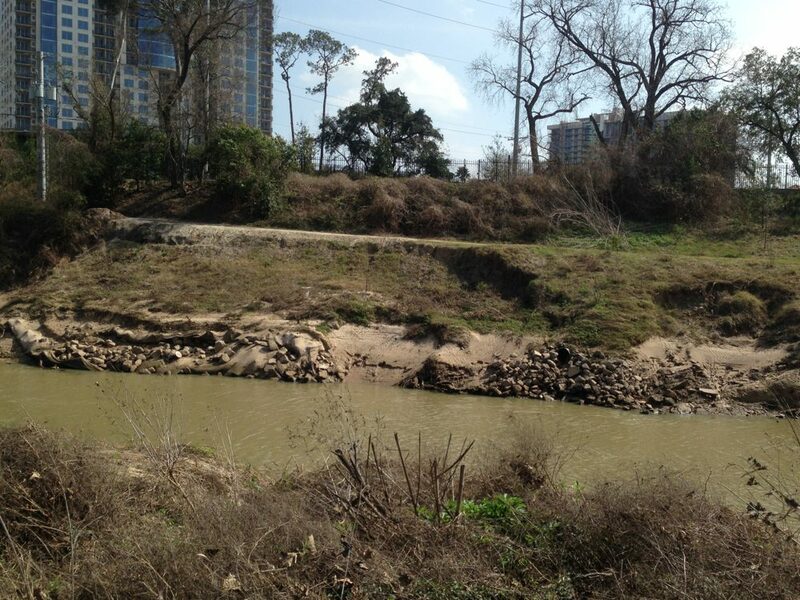 Same view of Buffalo Bayou east of Montrose on March 27, 2015, after channelization by the Harris County Flood Control District. 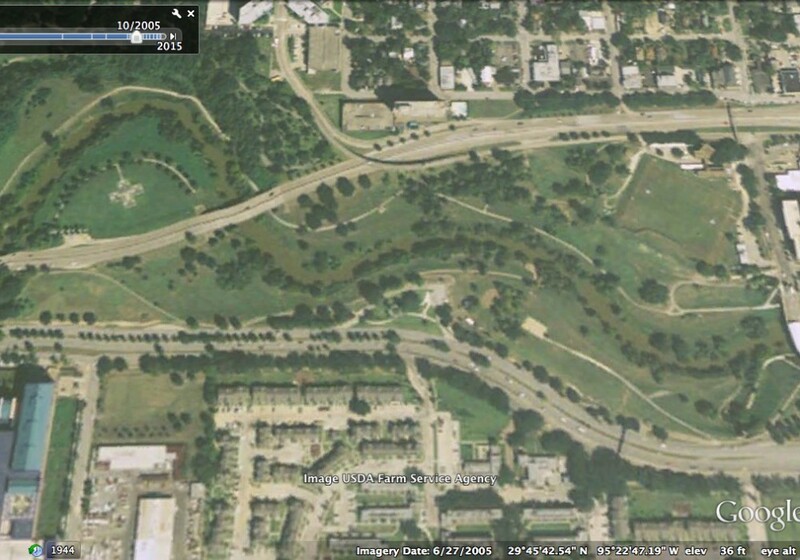 Downstream stretch of Buffalo Bayou Park between the Houston Police Officers memorial and Sabine Street on June 27, 2005. 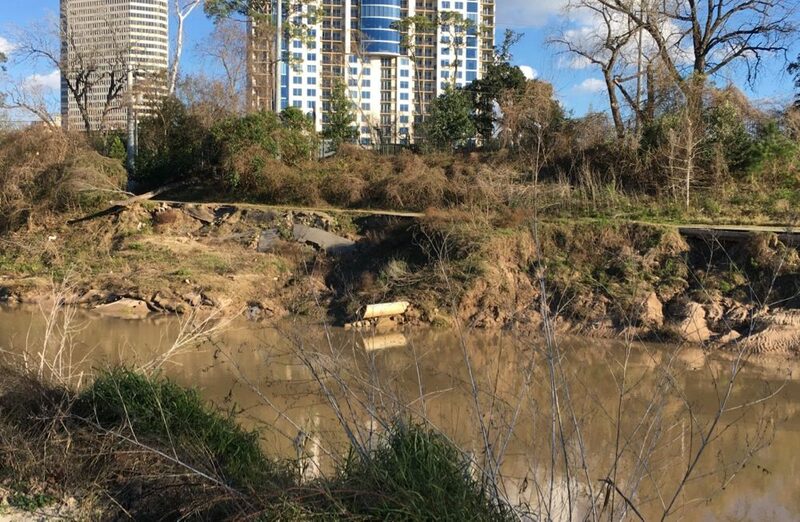 Same stretch of Buffalo Bayou above Sabine Street on March 27, 2015, after bank "stabilization" by the flood control district. 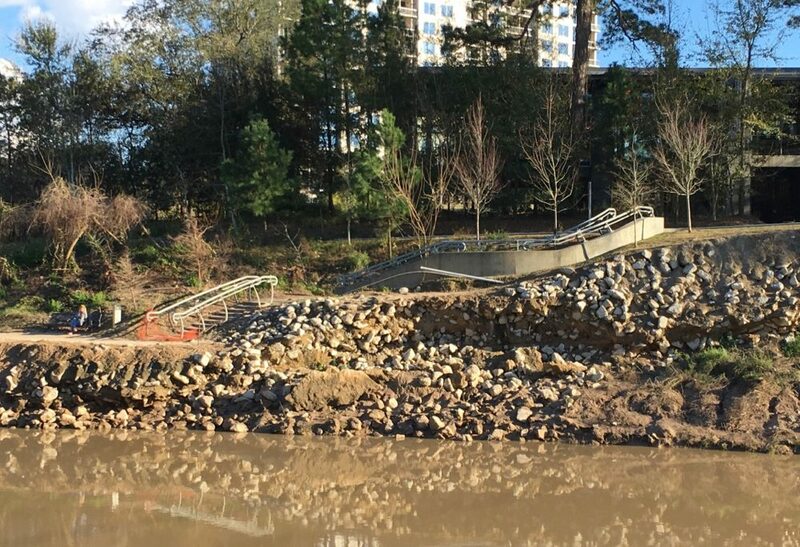 And here’s a slide show of photographs documenting the repeated, costly, and futile repairs to the south bank of the bayou below a sidewalk just upstream from The Dunlavy restaurant. 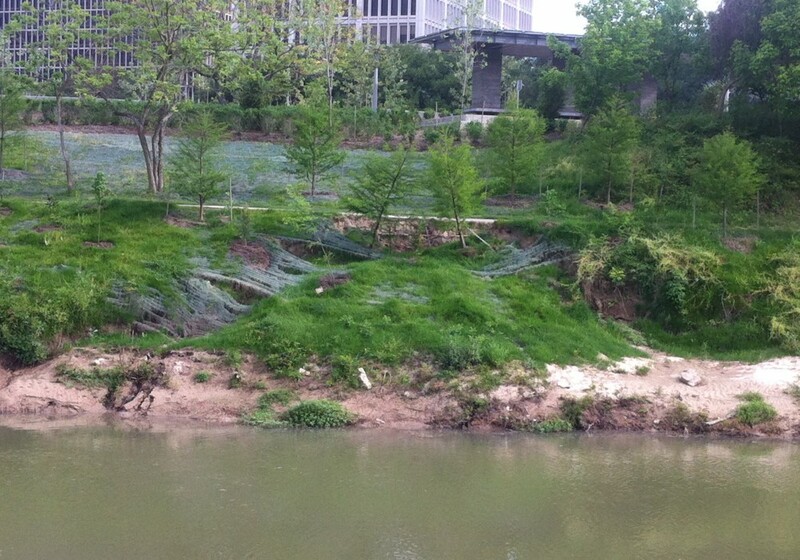 Grass applied to bank in attempt to stabilize. 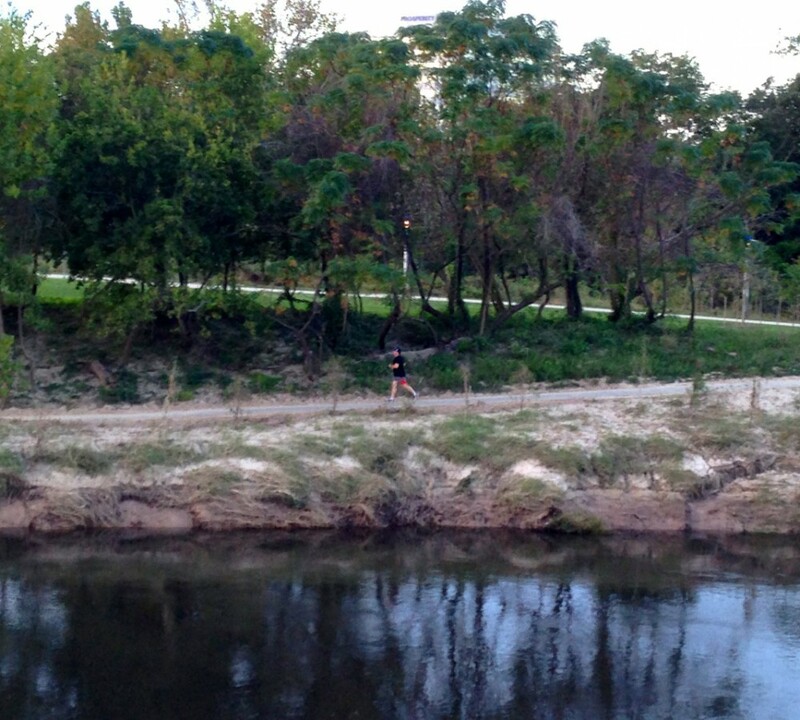 Photo March 4, 2016. 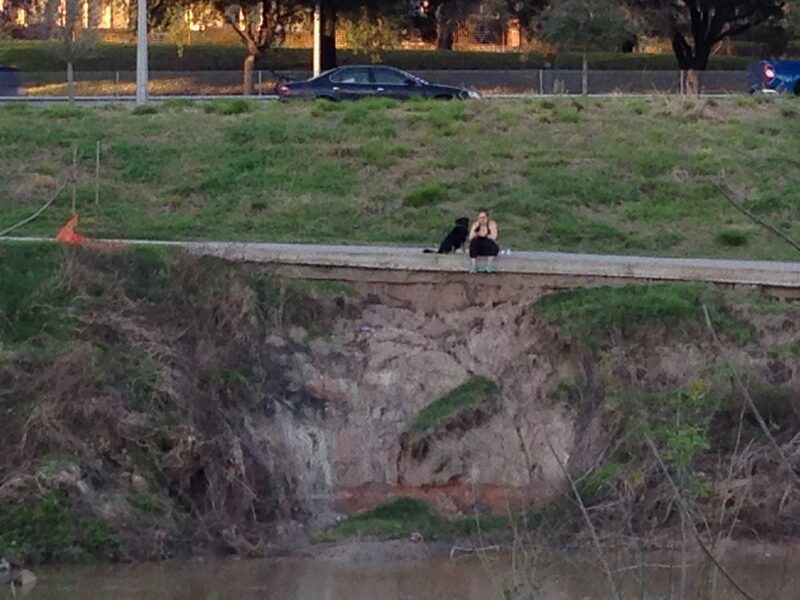 Same location on Feb. 8, 2017. 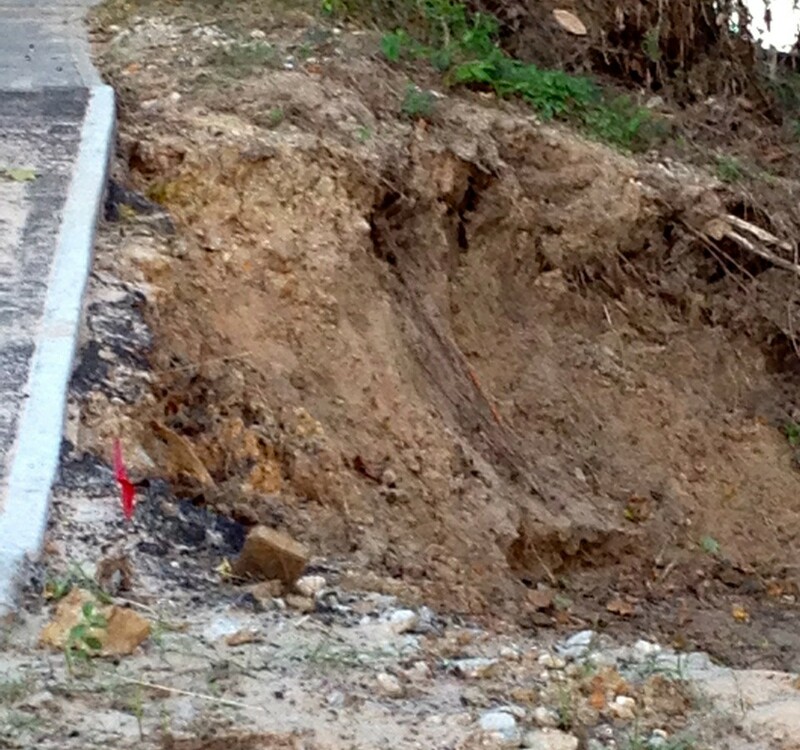 Same bank and sidewalk on Jan. 27, 2019, after numerous failed repairs.